Hello fellow book worms, welcome to this weeks Read With Me. Now I have to admit I have struggled to read an awful lot this week. A mixture of reasons really. The hubby has been at home most nights and when he is back we tend to catch up on some TV watching. The toddler has been a monkey for sleeping this week which leads on to me beingjust too tired to concentrate on a book properly. It may sound silly but when I don't get to read, I really miss doing it. it's nice to be able to escape to an alternative world every once in a while. I don't know about you but I can find myself missing a book once I've finished reading it. One book I did read last week, well re read was Fifty Shades of Grey, not everyones cup of tea but I decided to go and watch the film at the weekend and wanted to refresh my memory. I have to say it was true to the book in so many ways although not as steamy as I'd like ;) but I felt it was made to be more like a rom com. Enough of my chat. My favourite post from last week was from Boo Roo and Tigger too, she reviewed a wonderful book called How Lion Became King of Tinga Tinga Land, the illustrations are truely captivating. Now onto the all important link up. New? Take a look here at what Read With Me is all about. Regualr? Get linking, commenting and please display my badge if possible. OOPS! Just realized I already linked up that post> hope that is ok? We'll have to agree to disagree about 50 shades ;-) Give me a gentle children's book any day over Mr Grey. Thanks for hosting - hope you have a fabulous week! Thanks for hosting again. 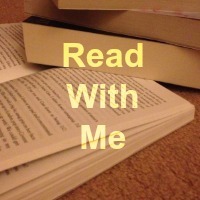 I'm looking for something new to read so hopefully the fellow bloggers will provide some inspiration.